I’ve got the FEVER! Spring Fever, that is, and all of the wonderful manic behavior that goes with it. March was it’s usual tempestuous self, but I also experienced some really good times. My own Angelini Ballerini starred in the school production of The Pajama Game as “Babe Williams” (color me the proud Mom! ), we shot our B roll in and around New York City (yes, that was me in the Farmer’s Market in Union Square, and prancing about in Jackson Heights! ), and the new production team at Food Network have been working diligently to make me feel welcome and at home. I am also ecstatic to welcome my new assistant, Carolina Penafiel to the ranks. Carolina is a fabulous Chilena, who has worked on productions of Viva Daisy! 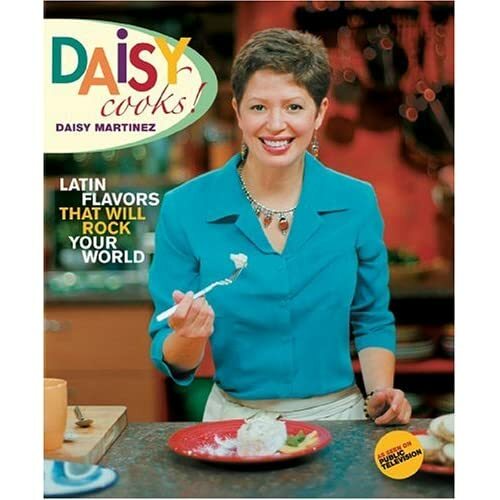 and Daisy Cooks!, so she is no stranger to the team. There is nothing Carolina doesn’t do, and she does it with grace, style and aplomb! April is a big birthday month here at Casa Daisy, too. Angie’s birthday is April 3rd, Marc celebrates his on April 6th , and my dear friend and sister-at-heart Violette, hangs her birthday banner out on April 12th. As you can well imagine, all of these birthdays are cause for much celebration, and nobody loves a party like I do! While it is a “Daisy” tradition to make my children’s favorite dishes for their birthday dinner, Violette has decided to have a birthday brunch this year, not just to celebrate her birthday, but her fabulous new Park Slope garden apartment. Well, you know that I’ll be helping her with her brunch spread! Violette is planning on White Peach Bellini’s, but I’m thinking Tortilla Española, and a Sausage Coca. These will be perfect for room temperature noshing, so you know where I’ll be for Violette’s birthday! While Violette is mixing up her Bellinis, I’ll be sure to be stirring up a pitcher of White Sangria to share with her party, as well! I’m also very much looking forward to going back to studio and filming the next round of Viva Daisy, playing my Jesus Christ Superstar soundtrack (I always do for Holy Week! ), and the Spring holidays. Two Easters ago, I failed to make up baskets for the boys, because I figured the only baby left in the house was Angela. Well, you can’t imagine the pouting and carrying on; from the boys! So I’ll be busy whenever I get a spare minute, making up baskets for Easter morning, for my “babies”; all four of them! Crank up that grill, boys and girls! Cooking and dining alfresco are right around the corner! 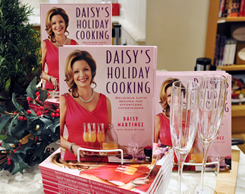 Happy Spring Holidays and Buen Provecho!